We themed most of our schoolwork around winter and hot cocoa today! I love to surprise the boys with some themed days every now and then since it just makes our days that much more fun. The older boys did start the day with another minute math test. Today we tried the ten times tables & Ian was able to get all 21 correct in the minute. Alec managed to get 14 and Ian congratulated him on getting so many. I think Alec was disappointed but I pointed out that he'd probably have his scoop earned in just another day or two. Once they were done we continued with math and Evan had another roll, count, and cover worksheet and the older two boys worked on a Hot Chocolate Math-- this is a very lengthy packet so we chose only one combination sheet and one of the sheets of word problems to tackle today. The boys had to work together to see how many combinations of drinks they could make using two different flavors, three different toppings, three different stirrers and three different containers. This was just like our snowman activity from last week and I was hopeful that at least one of the boys would remember that you can multiply to find the answer. In this case 2 x 3 x 3 x 3 =54 different combinations. We wrote out about 9 different combinations before the boys told me it was just like the snowman with his hats and mittens and they told me they could multiply the groupings and come up with the answer! They worked it out together and came up with 54. I then walked them through the four word problems. Ian had a much easier time with these since I often had to draw them out for Alec to be able to "see" the answer. They worked hard and they did a great job. Evan did amazing with his math. He no longer has to count the dots on the dice since he just knows what each set of dots equal now. He also knows a lot of the combination from trying them so often. I think we'll move onto subtraction soon, but not just yet. I want him to know them all really well before we move on. With math completed we moved onto reading. For reading today we read The Missing Mitten Mystery, The Hat, and The Mitten. We love Jan Brett and Steven Kellogg so I knew we'd enjoy these books. I really wanted stories that made us think of winter and snuggling up to keep warm! They all asked why we were bothering to read winter books about snow and mittens since it was another warm day and it was raining out besides. Hard to argue with that logic but I just insisted since it's still winter I'm not wrong. Eventually we will get more snow-- I think! We discussed what other books we remember by these authors and I slowly steered them towards talking about their favorite books. Why they love certain books and how they feel when they're reading favorite books. This was all in preparation for today's writing assignment. We had a writing/craft project today called A Good Book To Warm Up To (found here). The boys made a large paper mug. We traced and cut them out of watercolor paper then the boys used paint to decorate them. They got a bit carried away and forgot all about the fact that their book summary had to be glued onto their mugs. Ian made a painting of a horse and rider and Alec painted a family of sea turtles living in the ocean across the street from a house and road. They came out great but once I pointed out that they would be covered up the boys decided to make the paintings the backside of their mug and decorate the other side for their words to go on. Evan didn't want to paint his mug so he used printed scrapbook paper and finished up right away. While the mugs were drying they wrote a few sentences about a good book they would recommend to a friend. I had them write a rough draft first and then copy it, in pen, neatly and carefully onto the final draft. We then cut out ovals of "hot cocoa" and some marshmallows and glued the whole thing together. Then we warmed up some hot cocoa ourselves and had a snack break. 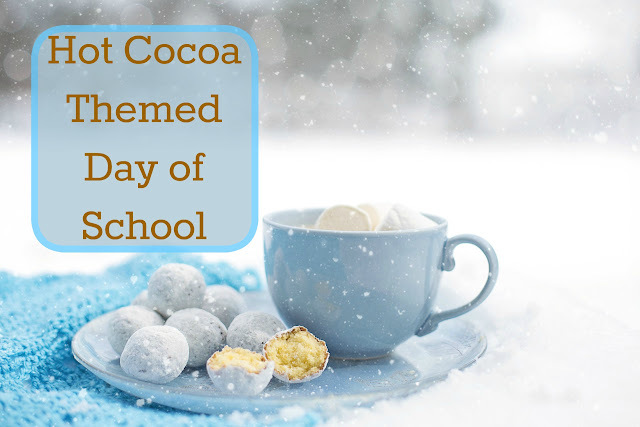 After all what good is a hot cocoa themed day if you're not going to drink hot cocoa?! It was a very morning of school!